Reeves, R. and E.d. Mitchell. "Narwhal". The Canadian Encyclopedia, 16 April 2019, Historica Canada. https://www.thecanadianencyclopedia.ca/en/article/narwhal. Accessed 22 April 2019. The narwhal, perhaps best known for its spiralled tusk, is a whale living in Canada’s arctic waters. Narwhal (Monodon monoceros) is a toothed whale of arctic seas. It is best known for its straight spiralled tusk, one of two teeth in the upper jaw that projects through the lip, reaching up to 3 m in length. This tusk, possessed by adult males and rarely females, may be used to establish and maintain dominance. Double-tusked narwhals occur occasionally. 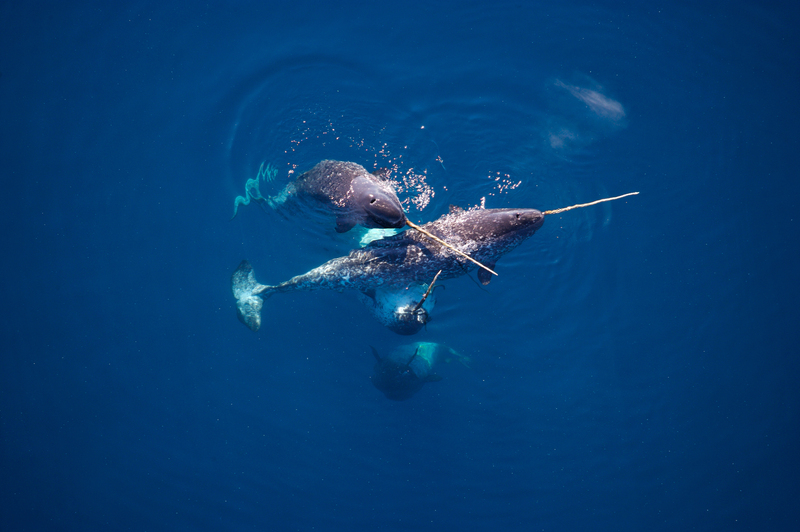 Narwhals grow to a maximum length of 5.8 m (excluding tusk). 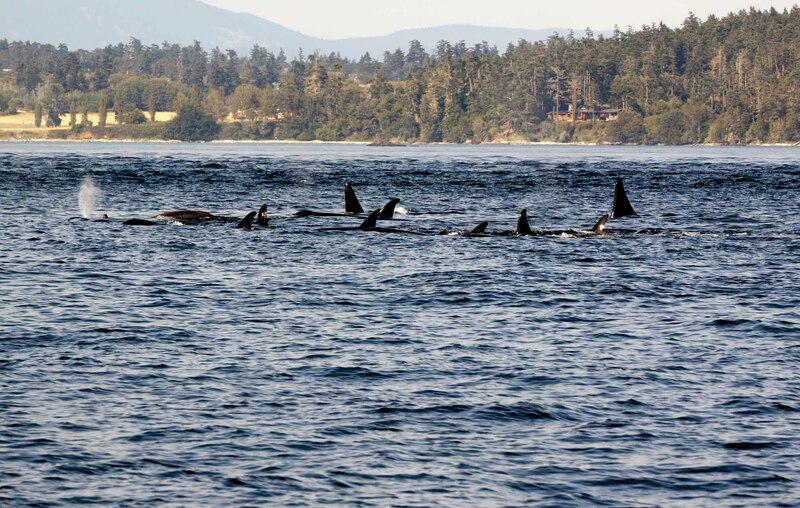 They have no dorsal fin. Body colour is grey at birth, almost black in juveniles, then white along the belly and mottled on the back in adults. Old individuals can be almost completely white, with dark spots largely confined to the dorsal surface. 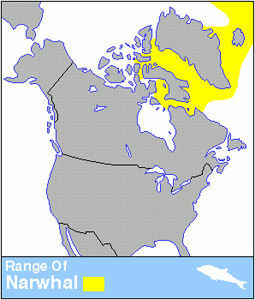 The narwhal's Canadian distribution is centered in Davis Strait, Baffin Bay, Lancaster Sound and the channels and fjords of the Arctic Archipelago, as well as in Hudson Strait, Repulse Bay and northern Hudson Bay. A separate population inhabits the Greenland Sea to the east of Greenland and around Svalbard. In winter, the ice-adapted narwhal is rarely found far from pack ice. It survives in the heavy pack ice by using narrow cracks and small pools of open water to breathe. The narwhal population in the Arctic Archipelago (including Davis Strait, Baffin Bay and Lancaster Sound) was estimated at more than 60,000 animals based on aerial survey data from 2002-2004. 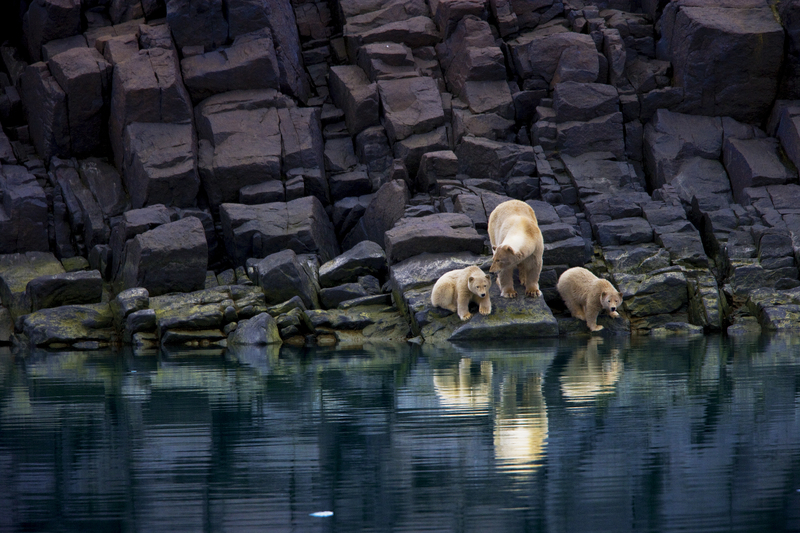 Numbers in the Hudson Strait, Repulse Bay and north Hudson Bay region were estimated at about 12,000 in 2011. Narwhals eat turbot and arctic cod, as well as squid and shrimp. Much of their food is obtained by diving to great depths — they are known to dive as deep as 1,500 m, and are suspected to be capable of diving even deeper. Female narwhals begin to bear calves at six to eight years of age. Mating takes place in April and May, and calves are born about 14 months later, in the following summer (June-August). 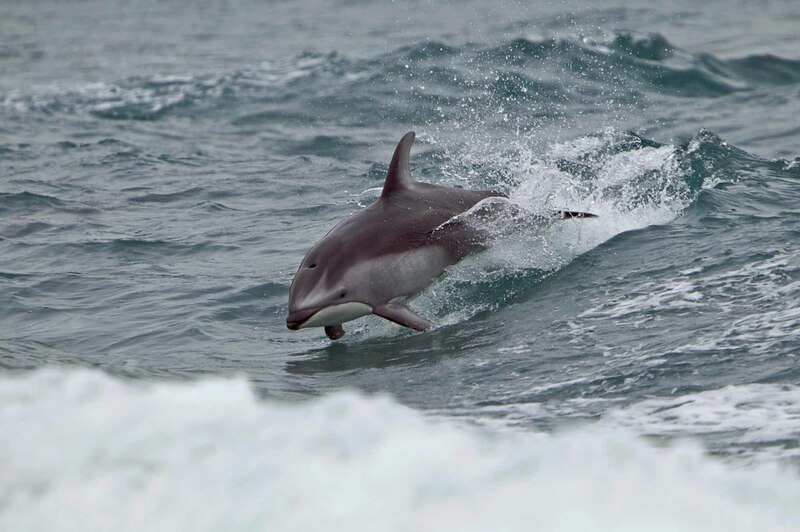 One calf is born at a time, which is typical of marine mammals. The calf is generally nursed for at least a year and perhaps for as long as 20 months. Traditionally, narwhals were hunted by Inuit primarily for meat, oil, sinew and muktuk (skin and adhering blubber). A market for narwhal ivory developed during the Middle Ages in Europe and the Far East. Today, Inuit hunt partly for the vitamin C-rich muktuk and partly to supply a global market for tusk ivory. Catch limits are set by governmental or inter-governmental bodies, and the hunt is managed by community-based groups. Narwhals are not held in captivity anywhere. Rapidly changing sea ice conditions in the Arctic are regarded as a potentially serious threat to narwhals. Such change may lead to increased frequency of ice entrapment, leading to mass mortality from starvation, suffocation or predation. The reduction of sea ice also means increased human activity in the Arctic, as previously unnavigable areas become more accessible. As such, the narwhal’s habitat may become more threatened by oil development, commercial fishing and shipping.